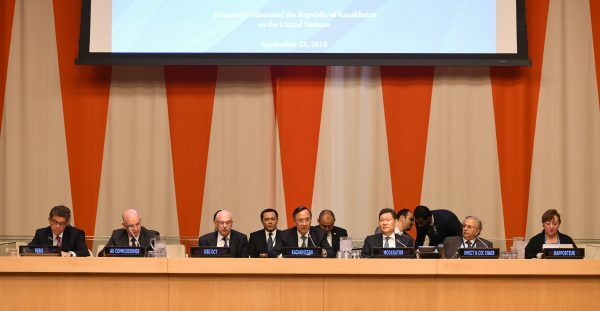 NEW YORK, 28 September 2018 – By adopting the Code of Conduct for the Achievement of a World Free of Terrorism, promoted by the Republic of Kazakhstan, Member States of the United Nations reiterated today in New York their commitments to strengthen international cooperation to reach the common goal of eradicating the most important threat to national, regional and international security. The Code of Conduct represents the first voluntary political declaration of its kind adopted at the global level. 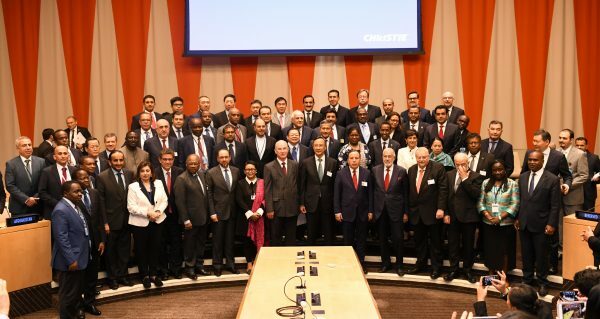 Its adoption heralded the advent at the global level of a wide coalition of countries united in the common goal of achieving a world free of terrorism, which had been proposed by President Nursultan Nazarbayev of Kazakhstan at the jubilee 70th Session of the United Nations General Assembly in September 2015. The document was launched and presented to Member States for accession by H.E. Kairat Abdrakhmanov, the Minister of Foreign Affairs of Kazakhstan, at a High Level Special Event on the margins of the General Debate of the 73rd Session of the UN General Assembly. It was consequently signed by foreign ministers and other authorized persons from about 70 countries. 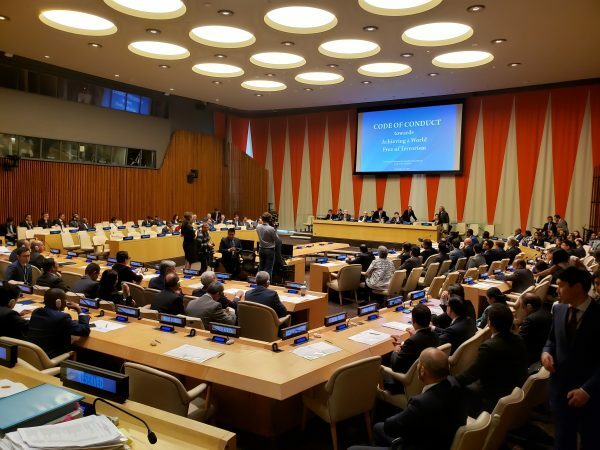 The Code of Conduct received wide ranging support because it recognized the inter-linkages between security, counterterrorism and development. As such, it was lauded as an indispensable pledge towards not only eradicating terrorism, but also advancement the Sustainable Development Goals. The High Level Event saw briefings by Under-Secretary-General Vladimir Voronkov, Head of the UN Office of Counter-Terrorism (UNOCT); Ambassador , Commissioner for Peace and Security of the African Union; Ambassador Gustavo Meza-Cuadra, Chair of the UN Security Council Counter-Terrorism Committee; as well as Ambassador Abdallah Al-Mouallimi, Head of the UN Counter-Terrorism Center () and the Group on Counterterrorism of the Organization of Islamic Conference (OIC). The Minister of Foreign Affairs of Kazakhstan, opening the meeting, stressed on the main thrusts of the document as well as the importance of its goals today, recalling that the contribution of Kazakhstan to the fight against international terrorism represents a priority policy for the country. The Code of Conduct builds on the consensus reached through the 19 international legal instruments to prevent and combat terrorist acts, as well as the UN Global Counter-Terrorism Strategy, in order to enunciate, in 10 simple and understandable pledges, all step necessary to reach a world free of terrorism. The added value of the Code is to chart the path towards an agreed timeline by the UN Centenary in 2045 for reaching a terrorism-free future, recalling that a goal is a dream with a deadline. Speakers noted the convergence of the goals of Kazakhstan, the United Nations and regional entities, and thanked Astana for initiating the preparation and launch of the Code of Conduct to strengthen international cooperation. Kazakhstan expresses hope for increasing the number of countries joining the document in the foreseeable future, as well as ensuring that adhering States abide by its premises to make sure that the Code of Conduct is not only adopted, but also fully implemented. Reference: The Code of Conduct contains 10 simple and understandable pledges in the field of counterterrorism. To ensure inadmissibility of supporting directly or indirectly terrorist groups in order to achieve political or geopolitical aims and no tolerance for terrorism, regardless of the targets or motives. To establish through the Code of Conduct a coalition of partners striving towards achieving a world free of terrorism by the Centenary of the United Nations. To support efforts of acceding states to intensify cooperation, while implementing international counterterrorism commitments. – Posted on September 29, 2018.